Add an upscale touch to your outdoor furniture set with the Treasure Garden 53 lb. cast aluminum umbrella base. 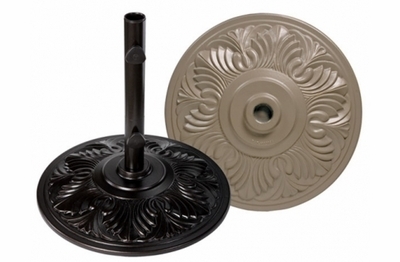 Constructed of weather-resistant cast aluminum, this decorative heavy duty base is available in several powder coated finishes that will work nicely with any decor. With its quality craftmanship, this umbrella base can handle even the harshest outdoor elements retaining its beauty from season to season. Long and short tubes are included for use with various sized umbrellas. When you are looking for a little relief from the heat, step outside, relax and cool off in the shade. The Treasure Garden all weather umbrella base is a stylish addition to your open air space.